Mr Cosmin Libotean is a long standing and well-regarded practitioner, relying on a professional experience of more than 14 years. His area of expertise covers commercial litigation, administrative litigation as well as disputes relating to complex public procurements. 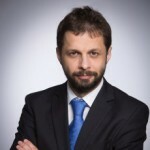 During his career as a litigator, he represented a vast portfolio of domestic and international companies in various industries – financial/banking, pharma, media or retail – before courts of law in Romania, in noteworthy files, with considerable financial implications. Furthermore, Cosmin provides legal assistance in insolvency and forced execution procedures, being unanimously praised by our firm’s clients for his proven promptitude and efficiency in handling sensitive files. Alongside his proven litigation expertise offered to many of the leading business groups based in Bucharest, Cosmin also coordinates Muşat & Asociaţii office in Braşov with respect to clients regional activities and investments. The world leader in manufacturing of equipment for construction and mining industry in the insolvency and foreclosure proceedings initiated against several debtors for recovery of assets and significant debts resulting from financial leasing contracts concerning various industrial equipment. A world leading manufacturer of construction and mining equipment in the actions initiated in courts against the client’s debtors. An important Israeli commercial bank in a complex commercial litigation regarding an application for cancellation of a decision of the bank whereby shares in amount of USD 33,350,000 were cancelled. The largest supplier of loading/unloading services in Constanta Port in a complex litigation with the shareholders, involving claims in amount of EUR 30,000,000. The largest manufacturer of ferrous components in Romania in several disputes against the National Agency of Fiscal Administration (ANAF), requesting that ANAF is ordered to pay the interest as well as the recovery of the court expenses incurred in a file regarding VAT settlement. A leading Romanian Television and Media Group in front of various courts of law (including the High Court of Romania) in a complex TV & Media litigation with RCS&RDS (the largest Romanian cable telecommunication) having claim value in excess of EUR 50 million. Further assisting and representing the Client (as claimant) in over 70 court litigations with various local entities including with the Romanian Fiscal Authority (claim value in excess of EUR 10 million). A leading Romanian real estate retailer in over 50 court litigations in front of various courts of law including Corporate/Commercial litigations, Capital markets related litigations shareholder disputes and administrative litigations. A worldwide financial corporation in multiple insolvency and foreclosure proceedings for the recovery of various commercial debts exceeding EUR 37,000,000, arisen from leasing contracts, including prosecution of debtors in criminal proceedings. A leading gas distribution company in Romania with respect to various claims arisen from services agreements regarding the design of their gas distribution network. 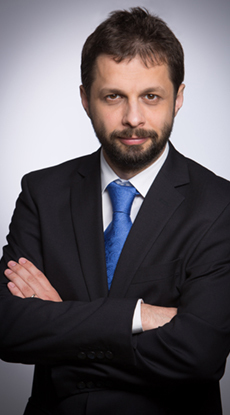 Representing the largest Romanian food and drinks producers, before various courts of law in over 50 commercial litigations and shareholders disputes. A leading real estate company in a dispute concerning the challenging, during the insolvency procedure, of the validity of a sale-purchase agreement concerning a real estate which the client concluded with the debtor. A worldwide distributor of various FMCG goods in Romania in a commercial litigation with claims exceeding EUR 5,000,000 arisen from the infringement of an exclusive distribution agreement in Romania. A leading Romanian leasing company (as defendant) in several commercial disputes initiated against the company. An important Italian financial institution in several insolvency and judicial reorganization proceedings initiated against its debtors for the recovery of several commercial debts resulting from loan contracts. A leading Romanian insurance company in various commercial disputes initiated against the company by former executives, involving a multimillion EURO claim. A local transport company in several disputes (challenge against enforcement, commercial actions for claims etc.) regarding the cable car in an important city in Romania, in amount of over EUR 7,500,000. A leading metallurgical and mining company, member of a Greek industrial conglomerate, active in the metallurgy, energy and engineering industry, for disputes regarding challenges against enforcement and merits actions against an alleged creditor which invoked a receivable of over USD 2,000,000.